"Stab! Stab! Stab! Stab! Stab!" let death come for them in a flash"
"Knock on Heaven's door with the head of a Jew"
Palestinian Media Watch documents the Palestinian Authority and Fatah leadership's messages to its population, showing both the PA ideology as well as how it directs the population to act. The current Palestinian terror wave is an excellent example of how the Palestinian population has responded to the leadership's message. Mahmoud Abbas and other PA leaders sparked the current terror and violence by frequently reiterating the PA libel that Israel is planning to destroy the Al-Aqsa Mosque, and they called on Palestinians to "defend it," "bless[ed] every drop of blood spilled" for it, "congratulated" the murderers and much more. Responding to the call, and following the praise and support from PA and Fatah leaders, among them Abbas, who referred to stabbings as "peaceful popular uprising," Palestinians are - independent of the leadership - inciting to murder on social media, including encouraging people to slit the throats of Jews, and committing murder themselves. 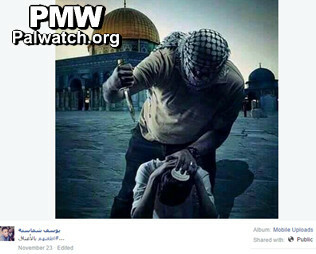 The following are examples of social media murder promotion by Palestinians on Facebook. Man: "What do you tell [Palestinian] youth in the West Bank?" Girl demonstrates with a long knife: "Stab! Stab! Stab! Stab! Stab!" A staged video shows two "Jews" harassing Palestinian children who are playing in the street. In revenge, a young Palestinian ambushes them, stabs one and slits the throat of the other, killing them both. And do not fear, Al-Aqsa awaits you"
An image posted to Facebook also vividly illustrates the call to cut the throats of Jews. 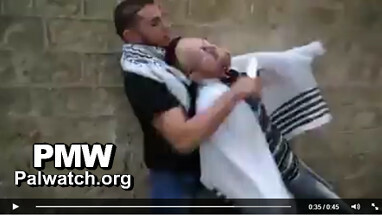 It shows a Palestinian with a knife in his hand standing over a Jew wearing a kippah (Jewish skullcap), holding him down, about to stab him in the neck. Our war is a war of the streets"
You won't find anything in our land but slaughter and stabbings. And today a curfew is imposed! Under the headline "Knock on Heaven's door with the head of a Jew," a Gazan singer posted a video that shows scenes from real stabbing attacks. Your necks and heads, your buses and soldiers have tasted the taste of a stabbing ambush!" Zionists, woe to you from the freedom generation"
See more examples of PMW's documentation of PA and Fatah support for the current terror wave. Posted text: "Knock on Heaven's door with the head of a Jew"
Stab, West Bank man and resist! Stab, West Bank man and resist! Cut, tear apart, come battle! O West Bank of [Yahya] Ayyash (i.e., Hamas bomb maker and inventor of suicide bombings), this is our Jerusalem! "The Islamic Bloc - Rafah"
Yahya Ayyash - First Hamas bomb-maker and leader of the of Hamas' Izz A-Din Al-Qassam Brigades in the West Bank, is considered the initiator of Palestinian suicide bombings. He built the bombs used in many terror attacks, including the Mehola Junction bombing (2 killed, 9 injured, April 16, 1993), the Afula bus bombing (8 killed, 55 injured, April 6, 1994), the Hadera central station bombing (6 killed, 30 injured, April 13, 1994), the Tel Aviv bus 5 bombing (22 killed, 47 injured, Oct. 19, 1994), the Ramat Gan bus bombing (6 killed, 33 wounded, July 24, 1995), the Ramat Eshkol bus bombing (5 killed, over 100 injured, Aug. 21, 1995), and the Bet Lid bombing (22 killed, 66 injured, Jan. 22, 1995). He was killed by Israeli security forces on Jan. 5, 1996. 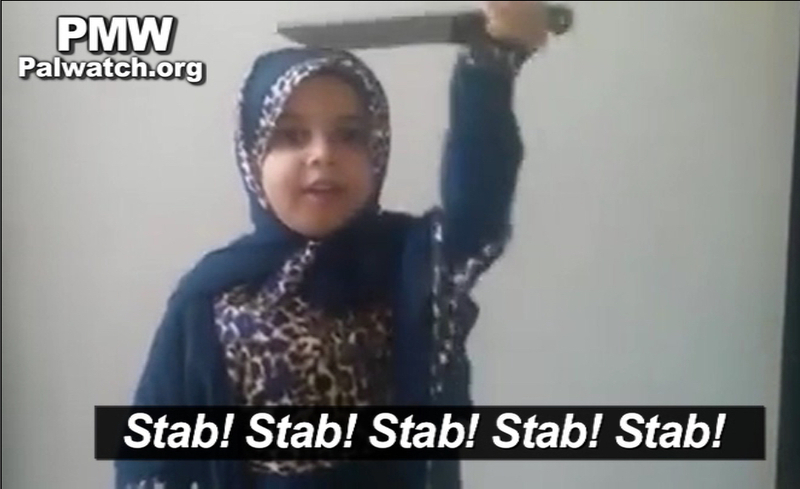 Posted text: "Rise and resist"
Palestinian video on Facebook promotes stabbing of Jews: Israelis are "doomed to death" "I stab a Zionist... I take revenge because I am a Palestinian Muslim"
"A short video titled 'Al-Aqsa awaits.' 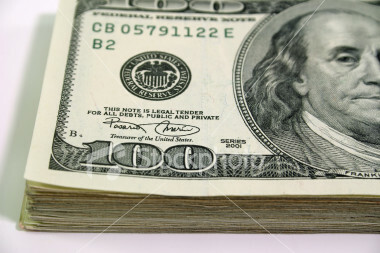 This is the message to the Zionist occupation and our residents in the West Bank..."
Under this are credits. The actor Rafat Sharrab narrates the video and also acts in it. The post includes different hashtags such as #stab, #Jerusalem_Intifada, and #Al-Aqsa_awaits. At the beginning of the video Shurrab says: "This video is a message that I want to send to those occupying our land, that they are doomed to death." I'm coming towards you, my enemy, from every house, neighborhood and street"
In the video, the actor Shurrab ambushes a "Jew" who is talking on the phone, wraps a keffiyeh around his face, and stabs him to death. At the moment of the stabbing, Gazan preacher Muhammad Salah Abu Rajab is heard shouting: "O my brother in the West Bank, stab! Stab! Stab! Stab! Stab! Do not hesitate. You have nothing but stabbings in our land. And today a curfew is imposed!" The "curfew" is a hint that Israelis are staying in their homes because they are afraid of being stabbed. Text in video: "#The_intifada_continues" and "#Stab"
Shurrab holds a knife in his hand and says: "I stab a Zionist, not because I belong to some party or group, I take revenge because I am a Palestinian Muslim." A boy is seen holding Fatah and Hamas flags. Shurrab takes them and throws them to the ground, and gives the boy a Palestinian flag in their place. The two walk together with a Palestinian flag in their hands. A girl from Khan Yunis, in the south of the Gaza Strip, supports the stabbing operations (i.e., terror attacks) by the young people of Hebron. "Israeli": "[Palestinian] youth are throwing stones at us [Israelis]"
"Israeli": ""[Palestinian] youth are running after us [Israelis] with knives"
"Israeli": "What do you tell [Palestinian] youth in the West Bank?" Girl: "Stab! Stab! Stab! Stab! Stab!" This video and the term "so what" is a reference to a hashtag appearing on Palestinian social media as a slogan used to encourage Palestinians to continue rioting, throwing rocks and using violence against Israelis. "#so_what" is a Palestinian response that makes light of Israel's alleged crimes, showing that Palestinians don't care. It also implies that no matter what Israel does, the Palestinians will continue not to care, and they will continue to riot, throw rocks, carry out stabbing attacks etc. The words refer to a video that went viral, showing an elderly Palestinian man arguing with Israeli soldiers. A soldier points to rioting Palestinians, saying: "They're throwing rocks at us." The old man replies: "So what, let them throw rocks." 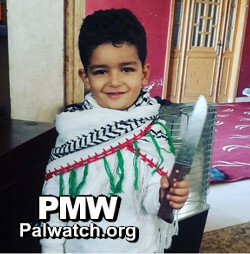 Muhannad Halabi - 19-year-old Palestinian terrorist who killed 2 Israelis, Rabbi Nehemiah Lavi and Aharon Bennett, and injured Bennett's wife, Adele, and their 2-year-old son in a stabbing attack in the Old City of Jerusalem on Oct. 3, 2015. Following the attack, he was shot and killed by Israeli security forces. Prior to his attack, in a post to his private Facebook page, the terrorist referred to recent terror attacks as part of a "third Intifada," and said that it was a response to Israel's actions at the Al-Aqsa Mosque and that the Palestinian people would not "succumb to humiliation." This is a reference to the PA libel that Israel is plotting to take over and destroy the Al-Aqsa Mosque and to the PA's portrayal of Jews praying on the Temple Mount as "an invasion of the Al-Aqsa Mosque. Fadi Alloun - 19-year-old Palestinian terrorist who stabbed and injured Israeli citizen Moshe Malka (15) near the Old City of Jerusalem on Oct. 3, 2015. Alloun fled and was shot and killed by Israeli police. Before his attack, Alloun had written on his Facebook page: "Oh Allah, my goal is Martyrdom-death (Shahada) or victory for Allah... Allah is great."